A rabbinical college founded by Dr. Isaac M. Wise at Cincinnati, Ohio, in 1875. In 1854 Dr. Wise had made an attempt to establish a similar institution under the name of the "Zion College Association." Failing, and being convinced that such a college could be established only through a union of congregations, he agitated for the formation of such a union. In 1872 Henry Adler of Lawrenceburg, Ind., offered $10,000 toward the establishment of a rabbinical college. 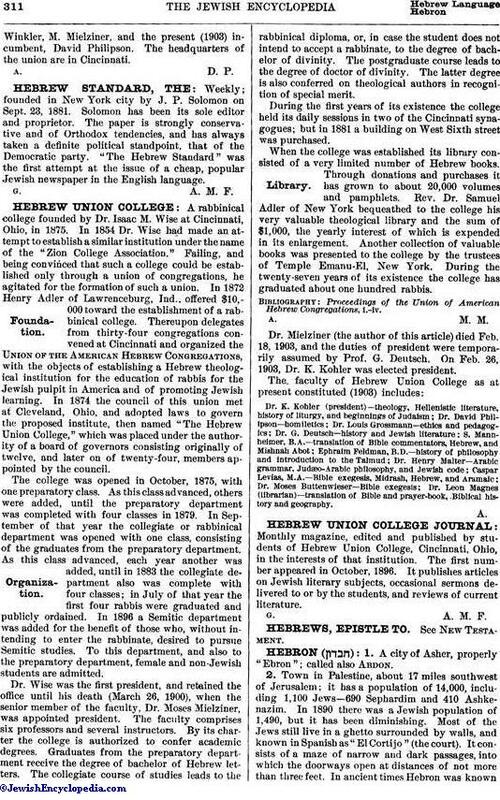 Thereupon delegates from thirty-four congregations convened at Cincinnati and organized the Union of the American Hebrew Congregations, with the objects of establishing a Hebrew theological institution for the education of rabbis for the Jewish pulpit in America and of promoting Jewish learning. In 1874 the council of this union met at Cleveland, Ohio, and adopted laws to govern the proposed institute, then named "The Hebrew Union College," which was placed under the authority of a board of governors consisting originally of twelve, and later on of twenty-four, members appointed by the council. The college was opened in October, 1875, with one preparatory class. As this class advanced, others were added, until the preparatory department was completed with four classes in 1879. In September of that year the collegiate or rabbinical department was opened with one class, consisting of the graduates from the preparatory department. As this class advanced, each year another was added, until in 1883 the collegiate department also was complete with four classes; in July of that year the first four rabbis were graduated and publicly ordained. In 1896 a Semitic department was added for the benefit of those who, without intending to enter the rabbinate, desired to pursue Semitic studies. To this department, and also to the preparatory department, female and non-Jewish students are admitted. Dr. Wise was the first president, and retained the office until his death (March 26, 1900), when the senior member of the faculty, Dr. Moses Mielziner, was appointed president. The faculty comprises six professors and several instructors. By its charter the college is authorized to confer academic degrees. Graduates from the preparatory department receive the degree of bachelor of Hebrew letters. The collegiate course of studies leads to the rabbinical diploma, or, in case the student does not intend to accept a rabbinate, to the degree of bachelor of divinity. The postgraduate course leads to the degree of doctor of divinity. The latter degree is also conferred on theological authors in recognition of special merit. During the first years of its existence the college held its daily sessions in two of the Cincinnati synagogues; but in 1881 a building on West Sixth street was purchased. When the college was established its library consisted of a very limited number of Hebrew books. Through donations and purchases it has grown to about 20,000 volumes and pamphlets. Rev. Dr. Samuel Adler of New York bequeathed to the college his very valuable theological library and the sum of $1,000, the yearly interest of which is expended in its enlargement. Another collection of valuable books was presented to the college by the trustees of Temple Emanu-El, New York. During the twenty-seven years of its existence the college has graduated about one hundred rabbis. Proceedings of the Union of American Hebrew Congregations. i.-iv. Dr. Mielziner (the author of this article) died Feb. 18, 1903, and the duties of president were temporarily assumed by Prof. G. Deutsch. On Feb. 26, 1903, Dr. K. Kohler was elected president. Dr. K. Kohler (president)—theology, Hellenistic literature, history of liturgy, and beginnings of Judaism; Dr. David Philipson—homiletics; Dr. Louis Grossmann—ethics and pedagogics; Dr. G. Deutsch—history and Jewish literature; S. Mannheimer, B.A.—translation of Bible commentators, Hebrew, and Mishnah Abot: Ephraim Feldman, B.D.—history of philosophy and introduction to the Talmud; Dr. Henry Malter—Arabic grammar, Judæo-Arabic philosophy, and Jewish code; Caspar Levias, M.A.—Bible exegesis, Midrash, Hebrew, and Aramaic; Dr. Moses Buttenwieser—Bible exegesis; Dr. Leon Magnes (librarian)—translation of Bible and prayer-book, Biblical history and geography.